· Keep straight on I-95 at the I-295 Richmond By-Pass exit and keep toward downtown Richmond. Stay on I-95 SOUTH through Richmond to Route 288 WEST –Go WEST 12 miles to Route 360. · Turn Right at the second Jetersville exit onto Amelia Springs Road – SR 642 (there will be an old abandoned volunteer fire station on your right and two or three Civil War Historical Markers at the corner where you turn.) That puts you in the center of the above map. 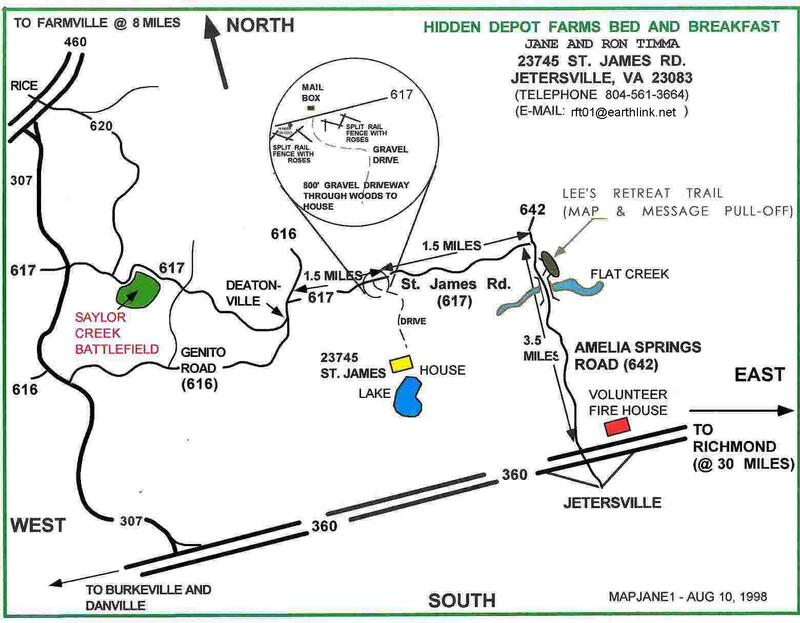 · Go 3 1/2 miles west on Amelia Springs Road - and after going down a hill, crossing a bridge over Flat Creek, and passing a Lee's Retreat Pull-Off on your right - you come to St. James Road/State Road 617 coming in from your left. Go left on St James Road for 1 1/2 miles. · Just over a sharp rise and curve - our driveway will be on the left - with a split rail fence. There's a pole with 23745 St. James Rd. is on the left side of the road. The number is also on our mailbox which is on the right side of St. James Rd - just before the driveway on the left. It’s a gravel drive but you can't see the house. Winding through the woods, the house is about 800 feet down that driveway. From I-81 North or South, take I-64 East (toward Richmond) until it crosses Route 15. Take Route 15 South to Farmville, VA.
Stay on Route 15 South until it merges with By-Pass Route 460 East - just west of Farmville. By-Pass 460 and 15 stay together until the second Farmville Business exit where Route 15 South turns right and continues south. At that exit, don’t take the Route 15 South exit, but stay on Route 460 East. Go 7.1 miles further on Route 460 East to Rice, VA and Route 307. Turn left on Route 307 – look for and follow sign for Route 307 East to Richmond. Go 1.5 Miles— Just over a sharp rise and curve - our driveway will be on the left - with a split rail fence. There's a pole with 23745 St. James Rd. on the left side of the road (Driveway side.) The number is also on our mailbox which is on the right side of St. James Rd - just before the driveway on the left. It’s a gravel drive but you can't see the house. Winding through the woods, the house is about 800 feet down that driveway and wanders through the trees – but we are at the end! DIRECTIONS FROM OTHER LOCATIONS - PROVIDED UPON REQUEST!